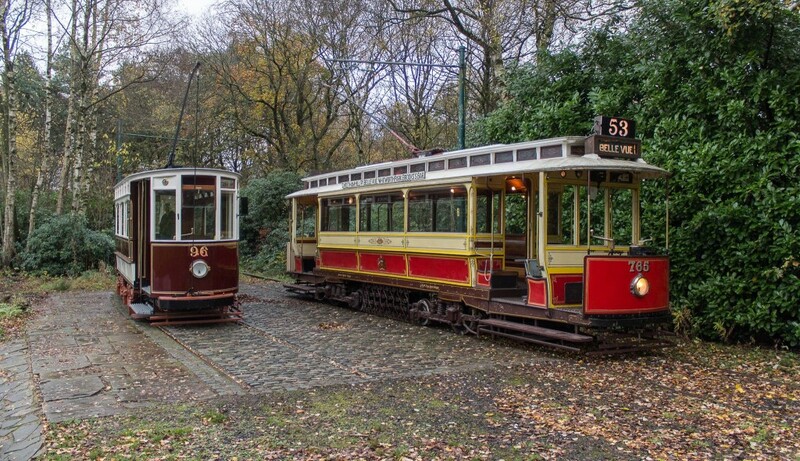 On Sunday 15th November, the Heaton Park Tramway staged one of their popular gala days offering an enhanced tram service as well as a few unusual photographic opportunities. 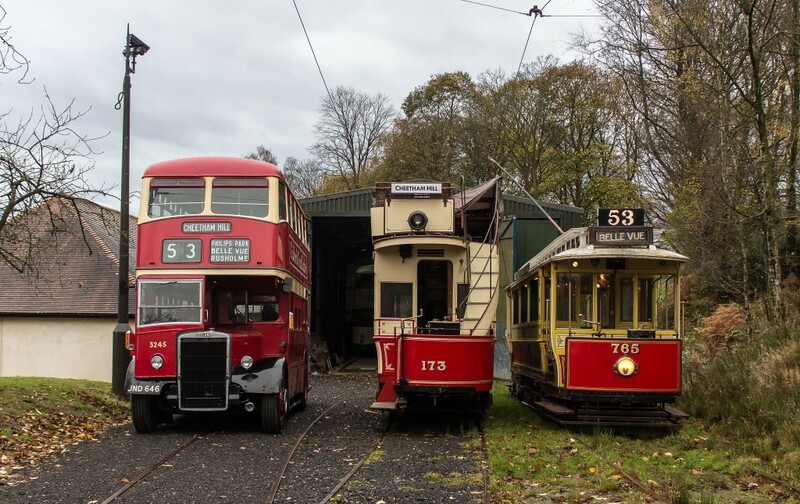 The event was slightly scaled back from what was originally planned but still featured all four available trams in service – although unfortunately a weekend of dismal weather did nothing to encourage extra custom and patronage was somewhat disappointing. The day’s events started with two Blackpool trams – Replica Vanguard 619 and Brush Railcoach 623 - in passenger service. Arguably the star of the day, Hull 96, was initially displayed on the siding at the old Lakeside terminus which is now rarely used, before joining the Blackpool cars in service. Finally, outside Lakeside Depot a visiting vintage bus from the nearby Greater Manchester Museum of Transport was displayed along with two Manchester tramcars; Manchester 173 which had been extracted from the depot for the event, and Manchester 765. Later on the line-up was broken up allowing 765 to carry passengers, meaning that all four currently serviceable trams were used to give rides to visitors over the course of the day. Since this event took place, work at Heaton Park has largely focussed on Stockport 5 and it is hoped that this will enable the popular open topper to return to use in 2016 as it has been greatly missed for the last two summers. Rotten woodwork is now being replaced and once this task is complete the upper deck can then be re-assembled, whilst other cleaning and paintwork touching-up is also carried out. 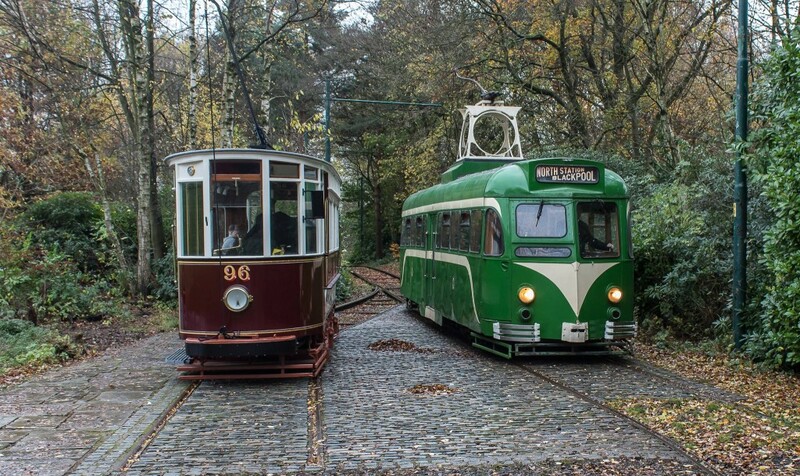 Providing none of the other resident trams suffer any serious ailments this could mean that as many as five trams will be available for service next year which would be a new record for the park if achieved. Early in the day and Hull 96 is seen posed on Old Lakeside siding as Manchester 765 passes by before taking its place in the main photographic line-up of the event. 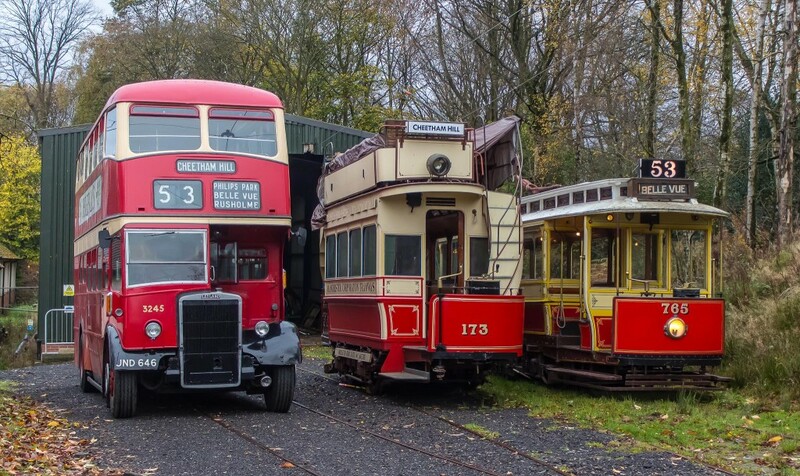 The Manchester line-up at Lakeside with a visiting bus joining tramcars 173 and 765 on display. Another look at the full Manchester line-up, this time from a slightly different angle. These are excellent pictures taken in very difficult conditions, well done Joe. Whether it was deliberate or coincidence I don’t know but the Bus, a Leyland PD2 with Metro Camel bodywork to the Corporations own design and specification was new in 1952 and was allocated to Queens Road depot. 173 alongside was new I think in 1901 and would have gone to the newly built Queens Road depot a vast difference in style between bus and tram obviously but a nice historical connection. Thanks for a good day guys in very difficult conditions.